You had a long day…tough workout, healthy meals, long day at work… and it’s finally time to kick back, relax, and enjoy a nice cold beer. You deserve it after all…nice job! And a beer or glass of wine is better than dessert right? So what’s the big deal? While moderate consumption of alcohol (one glass per day) may in fact have some health benefits for some people, too much alcohol can seriously hurt your fitness goals. Alcohol is a diuretic, which can lead to cramping and overall fatigue. Alcohol can prevent REM sleep, which can impair your muscle recovery and motivation in the gym the next day. Alcohol is full of “empty” calories, which contain no nutrients. There are 7 calories in 1 gram of alcohol. Not to mention all the other calories added that make the alcohol taste good! Alcohol can interfere with absorption of nutrients like B vitamins, vitamin A, and vitamin C.
Fruit infused water! You can design any flavor you want! Just add any fruit you like, such as berries, sliced oranges, or sliced peaches, to a jar of water and chill for a few hours until you’re ready to indulge. 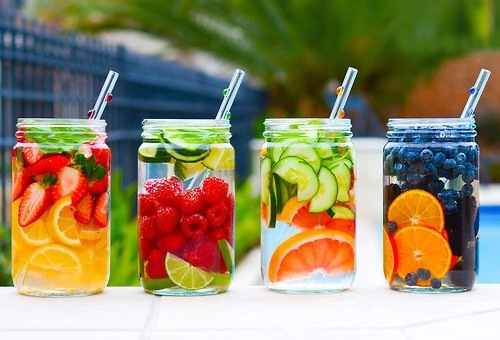 Fruit adds flavor and nutrients to your water. Don’t be afraid to add ingredients like mint, basil, or cucumber for added freshness. Coconut water, sea salt, and raw honey can add electrolytes, minerals, and a touch of flavor as well. Try sparkling mineral water for a cool fizz. Experiment and be creative! Cheers! ← Boost Brain Power…at the Gym!